Doc McStuffins First Responders Backpack Set – Only $9.72! First responders are on the way! now fans of Disney Junior s DOC MCSTUFFINS will be prepared for every toy-emergency with the DOC MCSTUFFINS first responders backpack! this purple and pink backpack looks just like the one Doc uses in the show and will have kids saving the day in no time! the backpack features a strap for easy carrying and has multiple pockets for storing all of the amazing DOC MCSTUFFINS first responder tools! the set even comes with the walkie-talkie Doc uses on the show to help respond to toys in need! 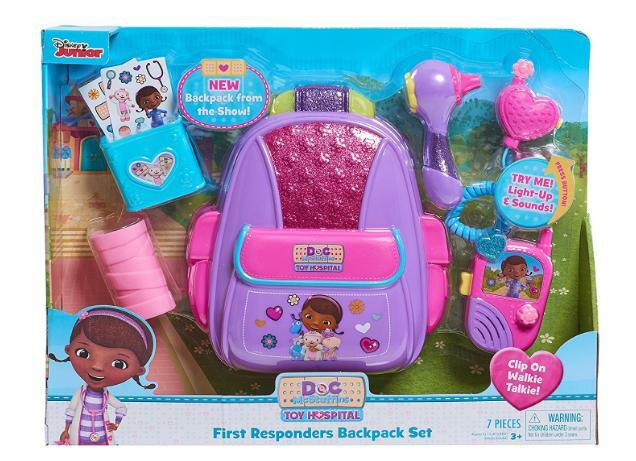 This new DOC MCSTUFFINS first responders backpack set is perfect for your little emergency responder! &Bull; includes one interactive light and sound replica of Doc s walkie talkie. Walkie talkie says fun Doc phrases from the show! Set also includes: play otoscope, play cast, and bandage box with bandage stickers.